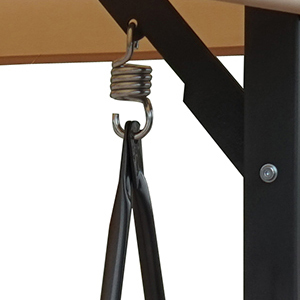 Strong & Durable: Heavy springs connect the swing to the frame, ensuring a smooth, gentle rocking motion. High quality, weather-resistant steel frame ensures long-lasting enjoyment for years to come. 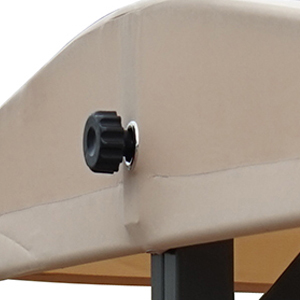 Weather resistant & Adjustable: The canopy design for sunshade and rain protection, against the wind and rain and dust. Comfortably swings up to 3 people for the perfect outdoor lounging experience. 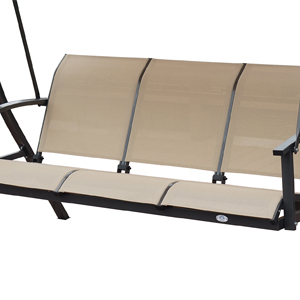 Easy to Clean: The polyester canopy and seat make your swing very easy to clean. Use the garden hose on the patio to wash the dirt and stains from the swings. It will become clean and new. The soothing cleansing process reduces your domestic stress. 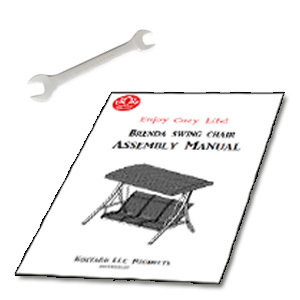 Easy to Assemble: Follow the instructions for simple assembly. Assembly time with 2 adults is approximately 1 hour. Tools included. 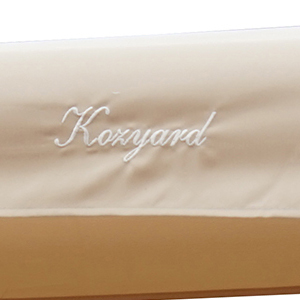 The Kozyard Brenda Patio Swing is your best bet for light and durable comfort throughout long summer days and warm winter evenings. This hammock glider compliments the look of any patio or porch with its crisp, understated color and contemporary design, perfect for encouraging languid conversations with cool drinks in hand. 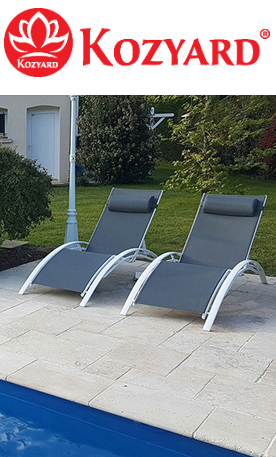 Whether you‘re looking for a fashionable piece to complete your garden, yard, deck, or pool, the Brenda is a superior swing that looks at home in any environment. With room for three to share, it also maximizes your outdoor space and is certain to be a favorite with your family. Both weather resistant and adjustable, the canopy is designed for protection against rain, wind, and dust, creating an island of shade on even the sunniest days. 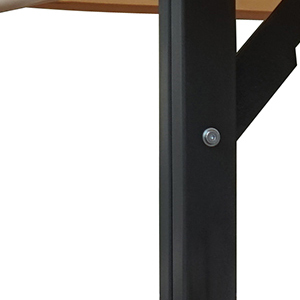 Heavy springs connect the swing to the frame, engineered to provide a smooth rocking motion that is always gentle and never abrasive. You will want to spend hours rocking in the roomy, textile fiber seats. Additional anti-slipping plastic end-ups improve the stability. The stable triangular base with smooth handrail combined with understated color are all designed with unique style, accentuate the color of the whole courtyard Perfect for the porch, patio, garden, yard, poolside and other outdoor living space. The canopy with sunshade angle could be adjusted by rotating the controller. Simply but detailed designed to bring you more convenience, letting you enjoy the sunshine and spend a nice time with your family. 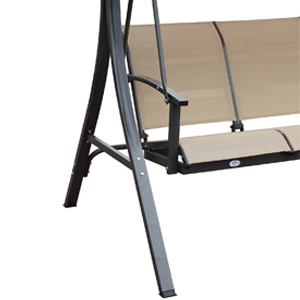 The Brenda Patio Swing was also created with strength and durability in mind. The sturdy steel frame resists chipping, peeling, rust, and corrosion, ensuring superior durability and strength for long-lasting use. The high quality of steel frame provides enjoyment for years to come. All screws are covered by screw nuts for rust protection. 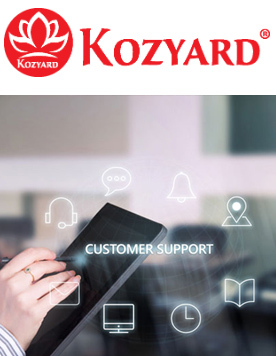 Kozyard knows that your life can be fast-paced and stressful, so we have created a product that is both easy to clean and assemble. It's so easy to clean that you can merely use your garden hose to rinse down the canopy and seat. Both are made of a fast-drying, polyester fabric that responds well to cleaning and retains its attractive appearance. The spacious and textile fiber seats give you a more comfortable ventilation awesome seating experience. This swing chair is very convenient to assemble by easy-to-follow, step-by-step instructions in approximately one hour. Construction designed easy to move and install. We've included some tools for your convenience.